The analysis of powder samples is a typical X-ray fluorescence spectrometry application. The samples can be press-formed or loose in the sample cell. 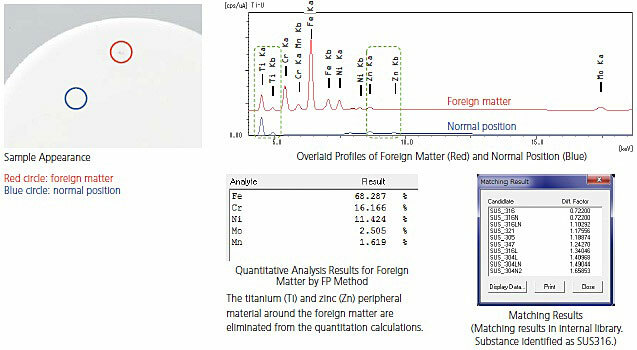 The following shows an example of the analysis of a cement standard substance using Na–U qualitative/quantitative analysis, which is the standard method for powder analysis. Accurate quantitation was achieved without using standard samples. Performing measurements in a vacuum achieved sensitive measurements of light elements. To measure a liquid sample, simply add it to a sample cell with film on the bottom. This method is effective for the detection and quantitation of additive components and worn metals in aqueous solutions, organic solvents, or oils. As shown below, the system achieves adequate detection of heavy elements in waste oil at ppm levels. EDX permits non-destructive elemental testing, making it effective for the analysis of foreign matter adhering to or mixed in with foods, drugs, or products. Using the sample observation camera and collimators makes it easy to identify trace foreign matter. The 1 mm irradiation diameter is effective at reducing the effects of peripheral material, resulting in accurate quantitative matching. In the example, the material was identified as SUS316. EDX is used for the analysis of elements contained in foods and biological samples. It is effective for process control when adding elements to foods, evaluating the poor growth of crops, and identifying the region or origin. The new background FP function achieves similar quantitation results with low sample volumes as from adequate sample volumes. It is effective in research applications when only small samples are available and in eliminating discrepancies due to differences in sample pretreatment by operators. EDX is ideal for the screening analysis of hazardous elements in products, such as electrical and electronic products, automobiles, and toys. No special equipment is required as chemical treatment is unnecessary. In this example with a plastic toy, comparison between measured areas indicated that the painted area contains barium (Ba), chromium (Cr), and lead (Pb). 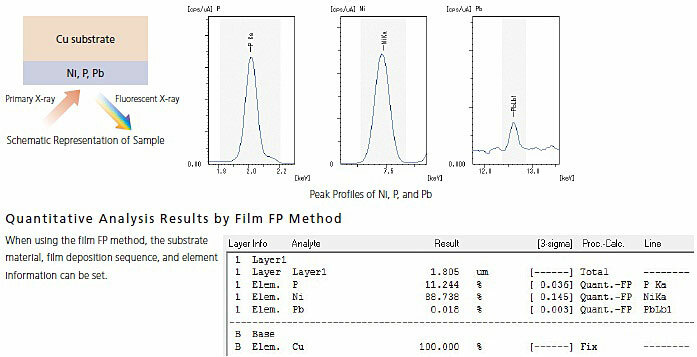 The film FP method permits the film thickness measurement of multilayer films, and simultaneous film thickness measurements and quantitation of the film composition. In this example, the plating thickness was measured as 1.8 μm. In addition, quantitation of the Ni and P main component and the detected trace Pb impurity was achieved. To enhance the quantitation precision for metal samples or to eliminate the effects of contamination or oxidation on the sample surface, machine and polish the sample surface with a lathe and rotary polishing machine. Pulverize samples with coarse particle sizes, or samples subject to effects of non-uniformity of mineral particles on the analysis surface. The glass bead method provides highly accurate analysis of oxide powders, such as rock. The sample is glassified using a flux such as Li2B4O7.